Hello and welcome to the 14th installment of the SWD. Earlier in the day, most parties reported and agreed that Tadef was captured by SAA, colonel and pilot Eyad Ghanem stationed in Kweires air base was killed by an IED around Tadef, still unclear if during entering or dismantling process. In the evening, Tadef front was filled with speculations, rumors and unconfirmed reports, to summarize everything claimed in chronological order; SAA attacked Al-Amiyah village controlled by TFSA, attack was repelled and 20 soldiers where killed and some captured, statement released by Hawar Kilis operation room claimed 22 government soldiers killed in Tadef area, full statement here. TFSA showed an ID card of one of soldiers allegedly killed, no other proof provided for the 22 claimed dead. A government tank was destroyed by TFSA, some even claim 2. Pro-rebel sources mostly agree that the number of captured SAA troops is 4, no footage to prove this claim either. 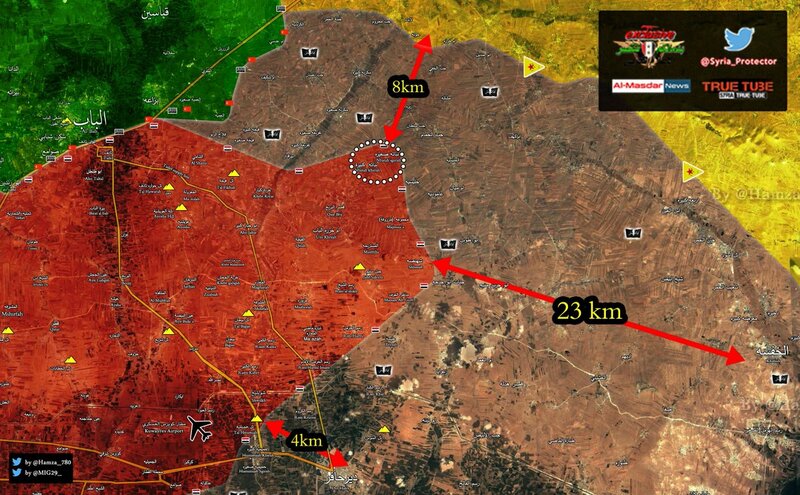 Most rebel sources claimed TFSA entered Tadef and are close to capturing it. Aside from the speculations, rumors and unconfirmed info, some clashes may have truly happened in Tadef, however this whole situation seems to be inflated and blown out of the proportion with unsustainable claims so far, until some footage appears for these widespread alleged events, everything above should be taken with a grain or two of salt. Situation in Tadef should be resolved soon with Turkey and Russia warning and/or ordering TFSA and SAA, respectively, to stop any action that goes against deal reached by two countries on demarcation line. Despite everything happening around Tadef, SAA Tiger Forces continue to advance in direction of SDF-held areas capturing villages of al Mazrufat, Nbat Kirbet and Nibat Saghirah. Unconfirmed reports about capture of Rasm al-Abed and al-Gharen villages south of Kweires air base. Another SAA advance happened today, but not in east Aleppo but rather southeast, in Khanaser region, village of Umm Miyal and hills around it which were lost in an IS offensive couple of weeks ago were captured today. TFSA is shelling SDF-held Mranaz and Malikia in Afrin region and a number of villages west of Manbij. SAA continues its gradual advance towards Palmyra, capturing driving school and quarries west of the city. SAA also allegedly took control of Maher oil and gas field with the help of tribal militias. In the evening SAA took control of the highest point on Jabal Hayyal, important location for the liberation process of Palmyra. Military operation for capture of Qaboun-Barzeh pocket seems to have started, after pounding the area for few days with heavy weaponry, Syrian Arab Army advanced today in Al-Qaboun farms and captured almost all of it, reported to be around 90%. Recent unconfirmed reports suggest that HTS based in Qaboun has used some chemical weapon, reportedly chlorine, against Syrian army and there are reports of suffocation cases. 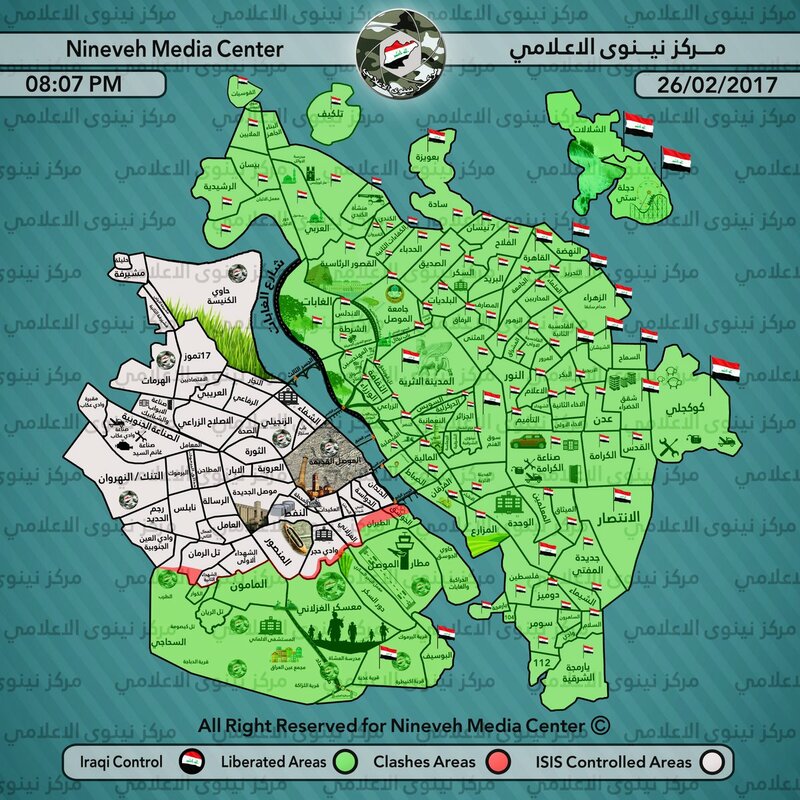 Situation in western Mosul remains almost the same as it was yesterday, with no significant territorial changes nor big events occuring. Iraq Joint Operations have officially announced Al-Mamun district completely liberated with clashes still ongoing in Al-Tayran and Wadi Hajar districts. On the 25th of February 2017 CJTF-OIR has conducted 12 strikes in Syria. CJTF-OIR‘s main focus in Syria at the moment is still Raqqa where they did 17 strikes supporting SDF‘s operation against IS destroying an artillery system, a mortar system, a rocket system, a watercraft, a weapons storage facility and a chemical weapons facility. Other areas where strikes occurred include Deir al-Zour, Palmyra and Shaddadi destroying two oil wellheads,a vehicle & a tactical vehicle and three fighting positions, two vehicles, an IS headquarters, a storage facility and a vehicle-borne bomb, respectively. Full report on CJTF-OIR strikes conducted in both Syria & Iraq can be found here.